Be prepared for any mission on that next outdoor adventure by stocking the gear bag with a Full-Size USMC Serrated Edge KA-BAR Knife. The rugged knife is crafted using strengthened, 1095 Cro-Van steel and fashioned into a clip-point shape for controlled piercing with an ample cutting belly. The 20-degree edge angle and flat grind with blade serrations adds to the knife's overall power and versatility--perfect for cutting through rougher materials, like synthetics or fabrics with loops. The handle on the USMC is leather-wrapped for comfort that is capable of withstanding the elements as well as delivering an attractive appearance. The knife includes a complementing leather sheath for safe storage and transport. 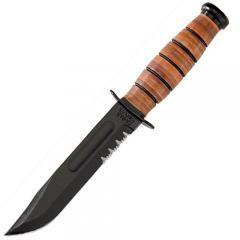 KA-BAR manufactures this item in the USA, while the sheath is imported from Mexico.